Even rats have habits. MIT professor Ann Graybiel trained rats to run a T-shaped maze. First, Graybiel’s team rewarded the rats for turning right or left based on a tone. Even after the researchers stopped giving treats, they found that the rats still responded to the sounds as if by habit. The human brain forms habits too, so why not make them rewarding ones? Here are four reasons why proofreading should be a habit you pursue. Typos make you seem angry. Harvard Business School doctoral candidate Andrew Brodsky says that unintentional typos are “a window into our emotions.” In his experiment, he presented subjects with angry messages. Subjects perceived the senders of angry messages containing typos as more enraged than the senders of mistake-free notes. Why do typos make emotions seem more intense? Perhaps because humans are always looking for cues in face-to-face communication. The expression in your eyes or your body language lets others know how you are feeling. In written communication, readers only have the words on the page. They may assume that typos mean a powerful emotion distracted you. It’s strong motivation to review your messages before you send them. Oh, and use emoticons. Typos land you on TV, but not in a good way. Your bizarre texting typos might appear on the Ellen Show. In a part she calls Clumsy Thumbsy, Ellen DeGeneres ridicules the nonsensical guesses of the autocorrect feature built into smartphones. Autocorrect is supposed to save you time, but it doesn’t always know what you are trying to say. Other errors might simply be the result of ignorance. Text messaging has its own lingo, so only use abbreviations and phrases that you understand. Did you hear about the woman who thought LOL meant “lots of love”? Grieving family members who received her message didn’t understand why the death of a family member was laugh-out-loud funny. Typos can cost you millions. One S cost Companies House an estimated £8.8 million, or about $12 million. Companies House is a British government agency that registers businesses throughout the United Kingdom. They mistakenly recorded that Taylor & Sons Ltd was shutting down its operations. Unfortunately, the company that was going out of business was Taylor & Son, a completely different enterprise. A few days later, Companies House made the correction, but the damage was already done. Thanks to the Internet, the news spread like wildfire. The 124-year-old Welsh engineering company was closing! Suppliers withdrew credit and canceled orders. It didn’t help that the managing director was on vacation when the mistake occurred; clients thought he was trying to run and hide. In short, it was a disaster for Taylor & Sons. They sued Companies House and won. Typos can make you think your whole childhood was a lie. Spinach is good for you, but it’s not going to give you superstrength. It turns out that the creators of the Popeye cartoon consulted an 1870s German study to find out how much iron spinach contains. Because the printers placed the decimal point one space too far to the right, the published research claimed that the leafy greens had ten times as much iron as they actually contain. Had it not been for that study, Popeye might have gotten his power boost from watermelon, dark chocolate, or lima beans—foods that contain as much or more iron than spinach does. The reward at the end of the rats’ maze wasn’t spinach, or they might not have been excited to receive it. They enjoyed sugar water and chocolate milk. The rewards for a mistake-free piece of writing are even sweeter than those treats. You won’t get sued for millions. You won’t need to endure public ridicule. You won’t seem angrier than you really are. You won’t mislead an entire generation of children. 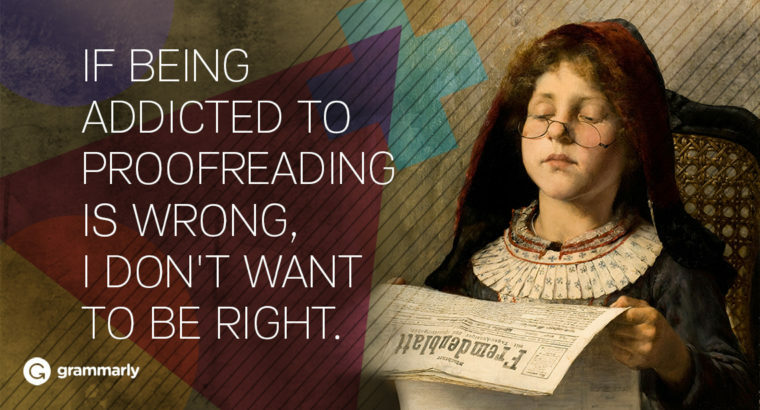 Aren’t these reasons enough to form a proofreading habit?